15 Nov 2018 --- A Cranberry Institute and USDA-funded study into the potential protective effects of cranberries on the gut microbiome has found that adding cranberries to a meat-based diet can reduce the rise in secondary gut bile acids that have been associated with colon and GI cancer. 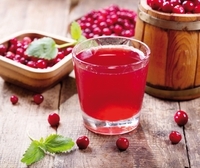 The feeding trial – published in The Journal of Nutritional Biochemistry – found that the addition of whole cranberry powder to this common diet lessened potentially carcinogenic secondary bile acids and blunted the decline in beneficial short-chain fatty acids (SCFA) in the gastrointestinal (GI) tract. “Among the 20 most commonly consumed fruits in the American diet, we chose to investigate cranberries and the gut microbiome as they are among the fruits with a high total phenol content,” says study author, Dr. Oliver Chen. An international team led by researchers from the Jean Mayer USDA Human Nutrition Research Center on Aging at Tufts University conducted a randomized, double-blind, crossover study of 11 healthy subjects (7 males, 4 females) aged 25 to 54 years with normal digestive function. A control diet, comprised of meats, dairy products and simple sugars was compared to a treatment diet – the control diet plus 30 grams of freeze-dried whole cranberry powder – for two, 5-day periods with a 2-week washout in between. The cranberry diet showed fewer potentially negative microbiota changes than the control diet phase. It appeared that adding cranberries to the control diet reduced the rise in secondary gut bile acids that have been associated with colon and GI cancer. Cranberries also lessened the drop in beneficial SCFA thought to help maintain healthy GI cells. Overall, the treatment diet suggested that cranberry constituents may help support a healthy gut microbiome.